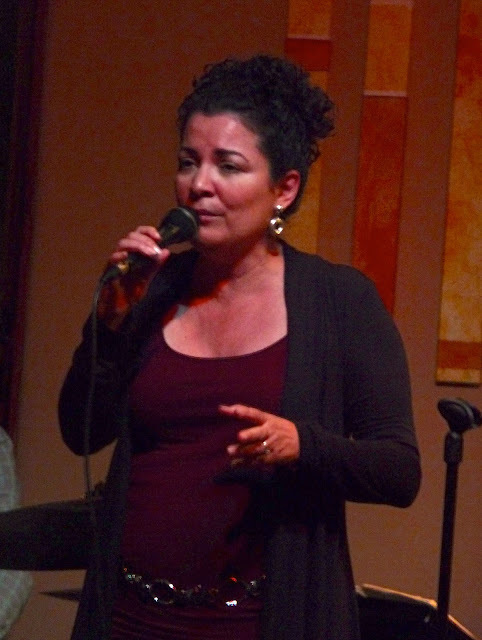 Carolyn Martinez has been singing to large crowds at Vicky's of Santa Fe in Indian Wells on Thursday nights. I had the opportunity to hear Carolyn sing over the past couple years and have always been impressed with her voice and the way she approaches lyrics. Carolyn is one of the few singers today that can sing lyrics with believable emotion convincing the listener that the lyric is really part of their personal life story. Carolyn is a joy to listen to and she sings only the best of songs from the "Great American Songbook". On Thursday evening, Carolyn impressed her audience singing many American classics and also sang several songs in Portuguese and Spanish. In my opinion, she is the best singer of Jobim in Desert. Carolyn's voice reminds me of the great voice of singing star Eydie Gorme, but Carolyn's voice is younger, softer and her range is very impressive. Carolyn was joined tonight by three top musicians, David Ring on Piano, Larry Holloway on Bass and Roger King on Drums. David Ring has been performing in the Desert area for quite a while but I never really heard him play for an entire evening until tonight. He is a great Piano player, and his Jazz solos were fresh, new and remarkably constructed. A real treat for any Jazz fan. Larry Holloway just keeps impressing his audiences with his outstanding Bass playing. Tonight was the first time that I got to heard Roger King play drums, and he did an impressive job playing soft when required and never missing a beat when the music got hot. Carolyn and her group appear at Vicky's every Thursday from 6:30 to 10:00. I understand that on February 17 the group will move to Sunday nights from 6:30 to 10:00. Don't miss the chance to hear Carolyn sing, you will not be disappointed. If you love Jazz, songs from the greatest American songwriters, great guitar playing and great burgers, there is only one place in the Desert that can fill this bill. You can find it all at Woody's Burgers and Beer in Palm Springs on Wednesday nights. Music lovers have known for a long time that Brian Nova is one of the most talented guitar players working today but few have had the opportunity to see Brian at his very best singing and playing in the perfect venue that allows him the freedom to musically do his thing! 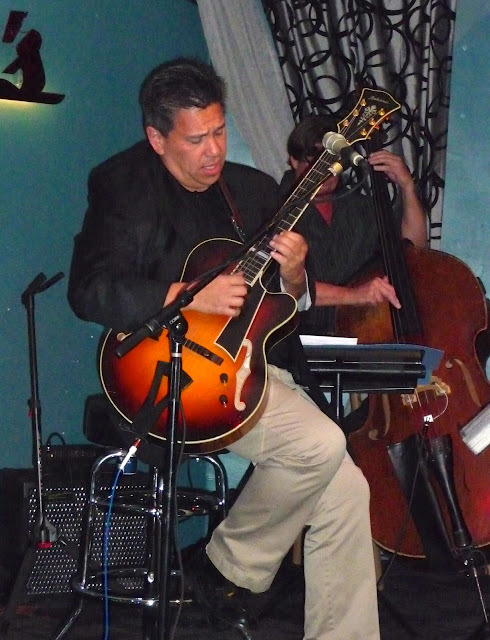 Brian Nova has played with many of the greats in Jazz and take it from me, he is also one of the greats. When it comes to playing jazz guitar, Brian has the fastest hands in the West. His playing imagination produces solos that are remarkably new, fresh and brilliant. In addition to his wonderful guitar work, Brian is also a great Jazz singer. His singing is original and creative just like his guitar playing. He is another example of the high level of musical talent living and working here in the California Desert. Brian and his group play at Woody's Burgers and Beer every Wednesday night. So put next Wednesday at Woody's on your "To Do" list for great Jazz and great food also. Yve Evans was at Backstreet Bistro playing and singing to a sold-out crowd of mostly very loyal fans. After you hear Yve perform, you never want to miss a chance to see and hear her again. When Yve performs you get the chance to see a major superstar. Yve can do it all. She has stage presence, plays Jazz on the keyboard as good as anyone you have ever heard and sings like an angel. She will remind you of all the great Jazz singers like Ella and Sarah. Oh by the way, did I say she has a great sense of humor in the Pearl Bailey school of comedy? The scene at Backstreet tonight was like a school reunion with Yve as President of the class! Supporting Yve tonight was desert favorite, Bill Saitta on bass. Bill is playing bass better than ever and he also happens to be a perfect straight man for Yve. Jay Lewis was the drummer tonight and he also is a perfect fit for Bill and Yve. Jay has the softest hands of any drummer playing in the desert. Yve and this group of musicians play frequently in the desert at Backstreet and also at the great Jazz club in Palm Springs, Woody's Burgers and Beer. I know there is a lot of great live Jazz here in the desert but take my advice: Check out where Yve is performing next and make sure you go to see her. Make sure you have reservations because her shows are always packed. Ari Shagal, The Next Carol King? Pre-Release CD Review: "To Each" from "The Summarily Dismissed"
When I took a look at the cover of this new, soon-to-be-released CD, "To Each" I was not sure I wanted to review it. The art work on the cover is hip and modern and yet left me with no clue as to what kind of music was inside. But my curiosity got the best of me and I decided to give it a listen. I am so glad I did. All of the songs were written by Ari Shagal who turns out to be a sensational song writer. The words and medodies are fresh, new and exciting. Ari Shagal is without doubt one of the brightest songwriters writing today. Her melodies are strong and her lyrics are current, hip and intelligent. This CD could easily become the score for a New York play. Each song is easy to listen to and each song tells its own short story. The group of musicians that created this CD are an exceptionally talented especially group. Each of the lead singers, Ferima Faye, Matthew Lomeo, Ari Shagal and the great Jazz volcalist Kenny Washington could easily star on their own CDs. The large cast of supporting musicians are also wonderful in every way resulting in a perfectly balanced joining of instruments with voice. I would have liked to see a picture of Ari Shagal and the other major singers. I believe it will become one of the best CD's of 2013. As to a description of the kind of music on the CD, I would have to say that it is a mix of Jazz, Pop and Soul combined with wonderful story-telling lyrics. This is the first CD from Ari Shagal and "The Summarily Dismissed" and it's a blockbuster! Ari Shagal does everything on this CD, sing, compose, arrange and play piano and organ, synthesizer and keyboard. She is a major league talent! I am so glad I decided to listen to this CD! Congratulations to Ari Shagal and the wonderfully talented performers on "To Each"for creating what will surely be one of the best CD's of 2013! The Manhattan Transfer made its annual visit to the McCallum Theatre in Palm Desert, California to the delight of a packed house of loyal long-time fans. This appearance was special as the group was celebrating its 40th year together. Hard to believe that this multitalented group has been singing for 40 years. They did not miss a beat or a note tonight. If there are any more talented vocal groups singing today, other than the sensational Four Freshmen, then I have not heard them. The four members of this group are mega singing stars whether singing as a group or individually. Tonight we had the pleasure of hearing the group sing its classic hits from the past and also had the pleasure of hearing each individual sing solos of their own choice. In my opinion, The Manhattan Transfer never sounded better with their amazing harmonies and vocalese stylings. Vocalese is a word they coined to express the art of singing lyrics in the form of a jazz instrument. Tim Hauser founded the current Manhattan Transfer group in 1972 and has produced many of the group's albums. Alan Paul is also a founding member of Manhattan and is a nine-time Grammy winner. Both Tim and Alan were from New Jersey. Janis Siegel is the third founding member of the group. Janis has released more than 6 solo albums and has garnered critical praise from her fans. Tonight, the group sang "Birdland", a song Janis arranged and won a Grammy for in 1980. Cheryl Bentyne joined the current group in 1979. Cheryl has also published many solo CDs and she won a Grammy with Bobby McFerrin for their vocal arrangement of "Another Night In Tunisia". Tonight's show was a clinic in how the human voice can turn into a beautiful musical instrument. What a treat for us that these four incredible talents shared the same stage to give us almost two hours of visual and listening ecstasy! The Manhatten Transfer is touring again and if they get to your city, don't miss a chance to see and hear them. If you are a fan of superb Jazz piano, especially when it's part of a great Jazz trio, then a new CD from Pamela Hines, is made just for you. This is my first experience hearing Pamela Hines and I became a fan after the first time I listened to the 9 cuts on her new CD, " 3.2.1.". 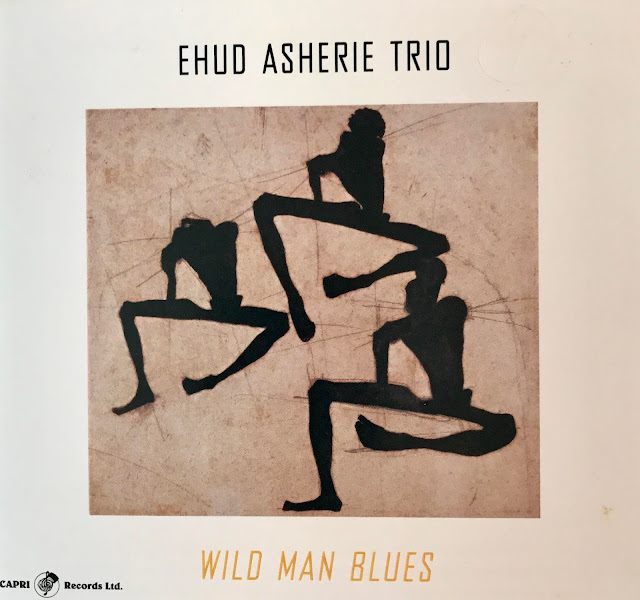 In my opinion, the quickest way to determine the talent of any Jazz musician is to listen to how the musician approaches the great standards. On this CD, Pamela presents the listener with truly inspiring renditions of three classic gems. The first two are ballads that never seem to get old, "Spring Can Really Hang You Up The Most" and "I Guess I'll Hang My Tears Out To Dry". Pamela approaches both of these great songs with emotion and understanding and her performance is marvelous by any Jazz measure. The third standard is an up tempo version of "East Of The Sun" that is fresh and exciting. To balance these standards, Pamela chose several Bill Evans compositions that would test the ability of most piano players. The first cut is "34 Skidoo" that Evans has lots of fun with by changing the time signature throughout the song. The other two Evans compositions were "B Minor Waltz" and "Loose Blues". Pamela Hines has been very busy in the last three decades performing in clubs, concerts and festivals in New York, Boston and nationally. She is a Jazz treasure, and I look forward to hearing lots more from her. Pamela is joined on this CD by two wonderfully talented musicians, David Clark on Bass and Yoron Israel on Drums. This CD will be released on January 15, 2013. Is there anything better than hearing a live 16 piece orchestra playing the best of the Count Basie playbook? Well, as it turns out there is, when you add the fabulous singing by Yve Evans. Tonight's performance at the Indian Wells Theater was inspiring for everyone in the packed house. On stage were some of the best musicians in the county being conducted by great bass player, Jeff Stover, playing the best of the Count Basie charts that never sounded better. They call themselves the Indian Wells Pops Orchestra, but this group of musicians is so much more than a local orchestra. They excel at producing the big band sound, and it is obvious to all that every talented member of this orchestra loves playing the big band charts. From the first moment Yve Evans walks the stage, she immediately captures her audience and once she has them, she never lets them go. Yve is not only a wonderful, caring person, she is also one of the greatest performing jazz singers of all times. We, here in the Coachella Valley, are so privileged to be able to see and hear Yve sing in many intimate settings. And as great as it is to listen to Yve sing in an intimate room, hearing her sing "Basie Songs" with a live 16 piece orchestra, is as good as it can get! If you missed this performance of the Indian Wells Pop Orchestra, you have another chance on Sunday Feb 10, when they return to play "Swing Time" a tribute to big band swing with guest singer, Sherry Williams. You can also get to enjoy the talents of Yve Evans who will be performing at Backstreet Bistro in Palm Desert on Tuesday, January 22nd. Don't miss the opportunity! 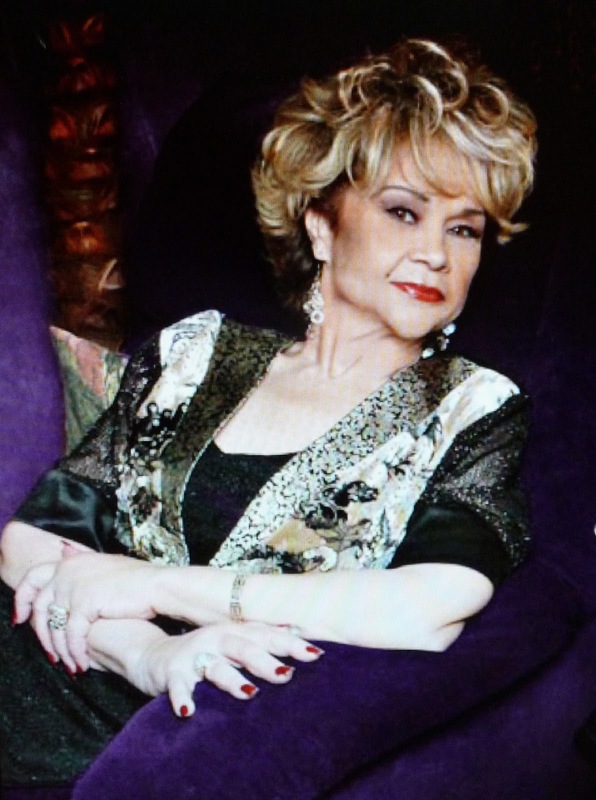 Etta James, also known as "Peaches", was a giant in Rhythm and Blues and Rock and Roll. She could do it all! During her long career she won six Grammys and 17 Blues Music Awards. She was born on January 25,1938 and past on January 20, 2012. Etta was inducted into the "Music Hall of Fame" in 1993, into the "Blues Hall of Fame" in 2001 and into the "Grammy Hall of Fame" in both 1999 and 2008. Etta started singing the blues and made the transition into Rhythm and Blues and then finished her career with what I believe was some of her best work singing great torch songs out of the "Great American Songbook". That's when I found her, late in her career but still singing like no other singers I had ever heard. 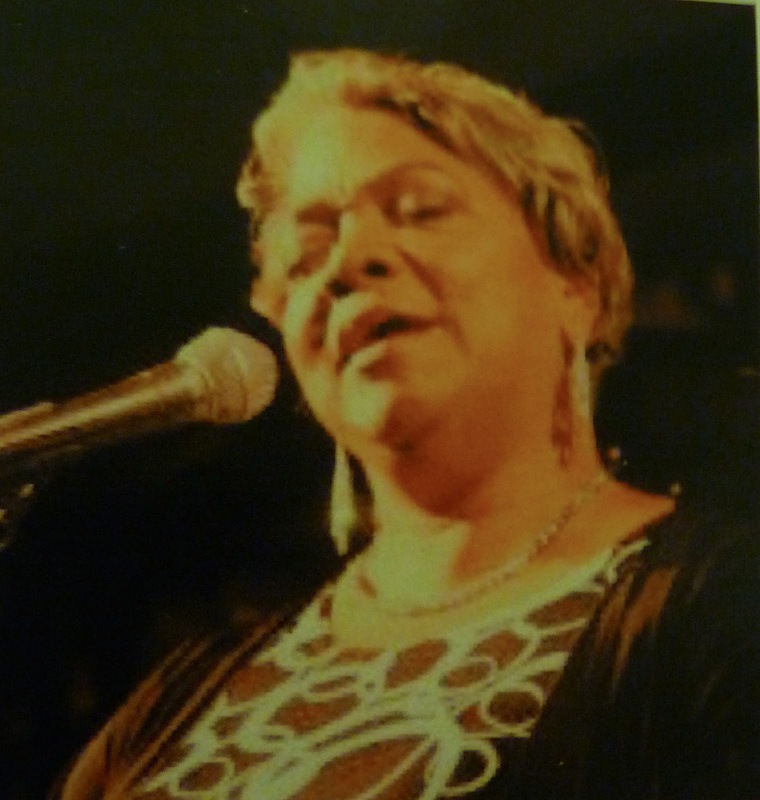 Most fans look back to her Blues singing as their reason for loving her so much, but I was just knock over after hearing love songs sung by Etta James. I found three classic Etta James' songs on "Youtube" that I wanted to pass on to you. After you listen to the three songs I have attached, take some time to research other gems in the Etta James library. It will be a very satisfying effort. "I want a Sunday Kind of Love"